Complete and unrivaled set of 2D and 3D charting types with many customization options is implemented to ensure that you have a superior set of data visualization methods "out of the box". Clustered, Stacked, Stacked%, XYZ scatter stack and XYZ scatter cluster multi bar modes. Smooth edge and cut edge bar styles as well as the standard pyramid, cylinder, ellipsoid, cone, inverted pyramid and inverted cone styles. Support for cluster stack combinations. Line series can be displayed as simple lines, tape, tube or stretched ellipsoids. Overlapped, Stacked and Stacked% multi line modes are supported. XY Scatter mode. Smooth line series - 2D Smooth line, 3D Smooth Line, XY Scatter Smooth Line, XYZ Scatter Smooth Line. 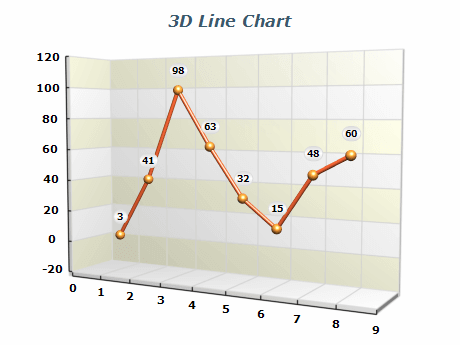 Step line series - 2D Step Line, 3D Step Line, DateTime Step Line. Area charts show trend or relative contributions over time that data series make to the total. They can be used to emphasize the volume or size of a data series over time (or any other dimension). Displaying multiple area series in different depths forms a more accurate view of the overall relation between particular data series. Smooth Area charts are similar to Standard Area charts, the difference being that the successive data points are connected with cubic spline segments instead of straight lines. 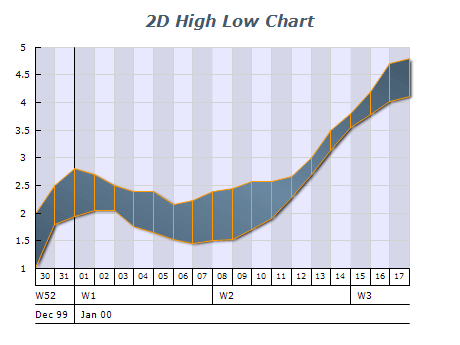 The example displays a 3D Smooth Area chart. Stacked area series provide capability for presenting cumulative data. 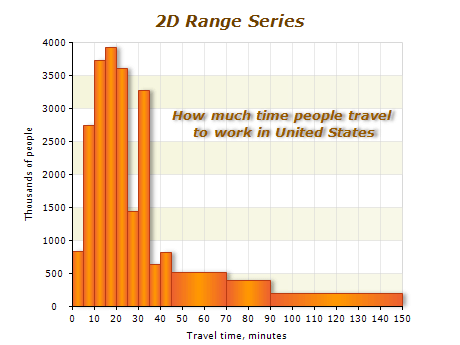 Stacked percent area series represent the contribution of data series to the total. XY mode allows presenting data series with non-regular sets of X-values. Stacked and Stacked% multi area modes are supported. XY Scatter mode. Supports markers. Standard Smooth Area, XY Smooth Area and Date-Time Smooth Area. Visualized as standard pies, torus segments or smooth edge pies. Rim, center or spider modes for pie data labels. 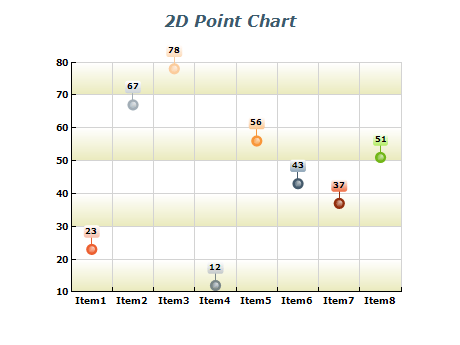 Point Charts display 1, 2 or 3-dimensional data as points in a Cartesian coordinate system. 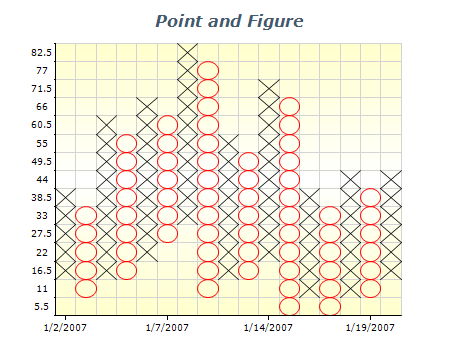 Values are represented by the position of the points on the chart. Point series is mainly intended to display discrete sets of self-dependent values. However, it may also be used as an alternative to line or bar series. In XYZ scatter mode, Point series may be used for presentation of data that is irregularly spread throughout 3D space using custom x and z values for the data points. Multiseries XYZ scatter Point charts are suitable for representing the relative 3D distribution of several different datasets. In XY scatter mode, Point series may be used for presentation of data that is irregularly spread throughout 2D space using custom x values for the data points. The point series supports a special rendering mode called clustered rendering, which allows you to render very large datasets. Clustering works by identifying densely populated regions of data, which are later visualized by a single point. This reduces the number of visual points on the screen and therefore improves performance. The point series supports a special rendering mode called clustered rendering, which allows you to render very large datasets. 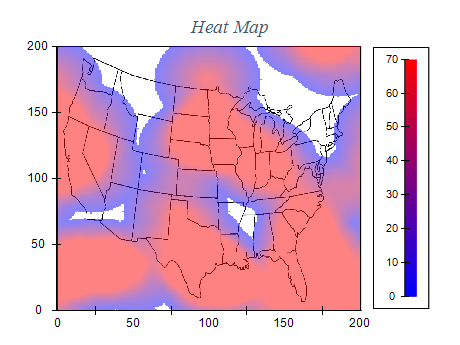 Clustering works by identifying densely populated regions of data, which are later visualized by a single point. This reduces the number of visual points on the screen and therefore improves performance. Points can be visualized as bar, cylinder , cone , inverted cone, pyramid, inverted pyramid, sphere, ellipse, cross, diagonal cross or star shape. XY and XYZ scatter modes are supported. 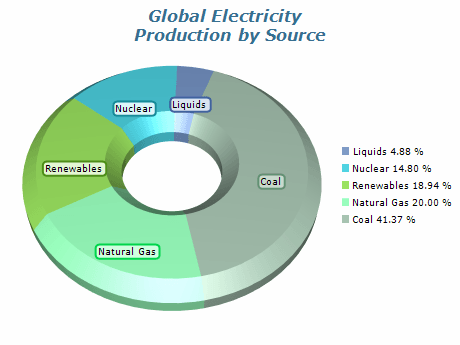 Bubble Charts are a convenient way for graphical representation of multi-dimensional data. The data points are displayed as circles (or other shapes) with variable parameters (size, position etc.) that depend on the input data. 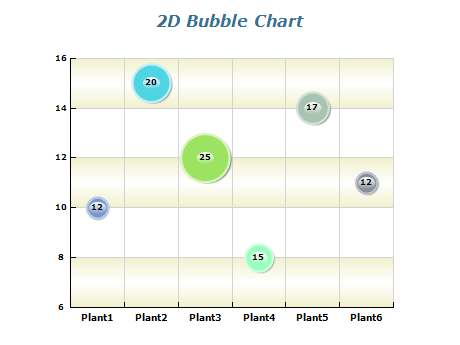 For example a 2D Bubble Chart can represent a dataset with up to 4 dimensions: X position, Y position, Size and Color. XYZ-Scatter bubble charts allow presentation of freely distributed values along all three axes. XY Scatter bubble charts allow presentation of freely distributed values along X and Y axes. Bubbles can be visualized as bar, cylinder , cone , inverted cone, pyramid, inverted pyramid, sphere, ellipse, cross, diagonal cross or star shape. XY and XYZ scatter modes are supported. 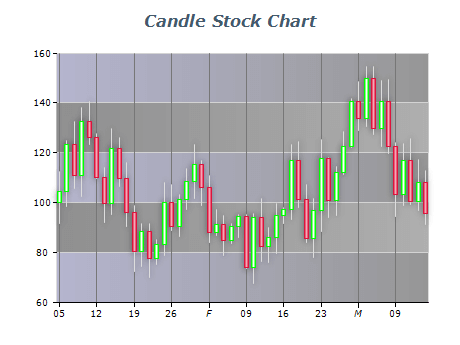 Stick and candle styles are supported. Open High Low and Close High Low chart subtypes are also supported. XY Scatter mode (date time stocks). Kagi charts display series of vertical lines to illustrate general levels of supply and demand for certain assets. The thickness and direction of the lines are dependent on the price action. Thick lines are drawn when the price breaks above the previous high price and is interpreted as an increase in demand. Thin lines are used to represent increased supply when the price falls below the previous low. 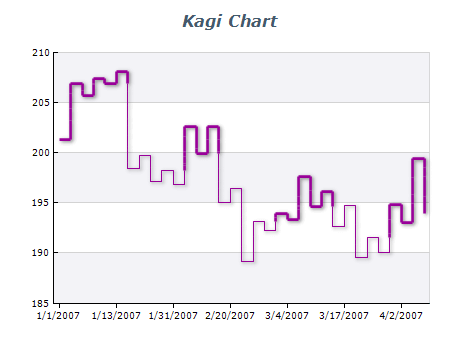 Kagi charts ignore the passage of time. Point and Figure charts display series of columns that are made up of 'X' or 'O' signs. 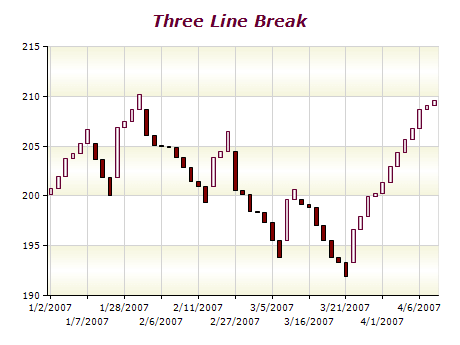 A column of X's represents an uptrend, while a column of O's represents a downtrend. The charts ignore the time factor and focus on price movements. Point and Figure charts are used to identify support levels, resistance levels and chart patterns. Smooth edge and cut edge bar styles as well as the standard pyramid, cylinder, ellipsoid, cone, inverted pyramid and inverted cone styles. 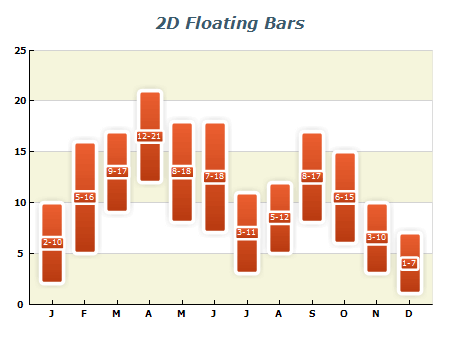 Date Time float bar, Date Time Clustered Float Bar. Contour and filled area styles. Supports markers. A special - elevated center feature. Contour and filled area styles. Supports markers. Radian and degree label formatting. High low area with built-in appearance logic. Supports markers. XY scatter mode is also supported (date time range chart). 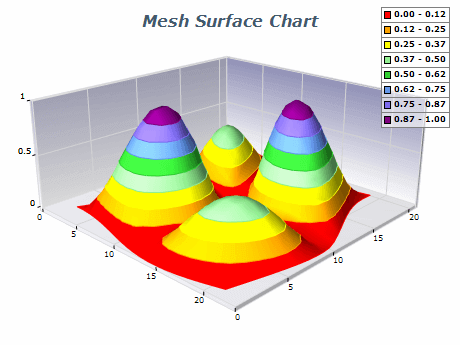 The Mesh Surface chart displays a surface with user-defined y-position, x-position and z-position values for each data point, in contrast to Grid Surface where only y-position (elevation) is user defined. Data points are ordered in a regular network. This example demonstrates a mesh representing a mathematically generated spiral surface. The Mesh surface series supports a FillEffect for the whole surface. The user can apply images, gradients, advanced gradients and patterns to the surface, as well as modify material properties like Specular Color, Emissive Color and Shininess. In this example are added texture and mesh frame. Mesh surface series may intersect. Using settings for surface filling allows higher readability of the represented data. "Empty data points" is a feature allowing data points to be specified with no value supplied. These data points are not rendered by the chart thus allowing empty shifts in a dimension scale. The Grid Surface chart displays a surface with user-defined elevation values for each data point and with X and Y coordinates which form a rectangular grid. This image demonstrates wire frame surface rendering. The surface filling is disabled and the frame style is "Mesh" - this way only mesh lines are displayed. The Grid surface series supports a FillEffect for the whole surface. The user can apply images, gradients, advanced gradients and patterns to the surface, as well as modify material properties like Specular Color, Emissive Color and Shininess. 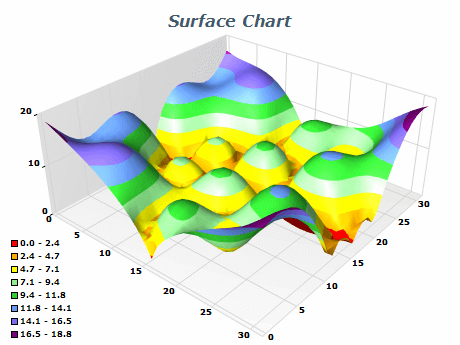 This example demonstrates a contour chart displayed with the Grid Surface Series. Below - the surface is rendered in flat mode and above - with the actual surface elevation. Empty data points is a feature allowing data points to be specified with no value supplied. These data points are not rendered by the chart thus allowing empty shifts in a dimension scale. 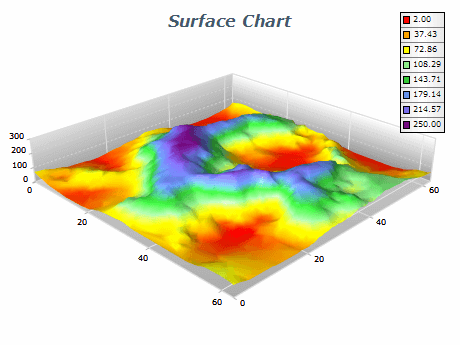 This image demonstrates a contour chart displayed with the Grid Surface Series. The chart uses orthogonal projection with camera elevation of 90 degrees, the lighting is disabled and the surface is rendered in flat mode. Here the Grid Surface chart is used to represent waves. This charting type can display a set of points with X, Y and Z coordinates as a 3D surface. In contrast to the Mesh Surface chart, the Triangulated Surface doesn't require the points to be ordered in a network. The control creates a triangular network automatically. 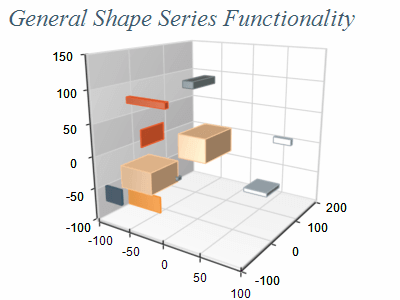 The Shape Series is a versatile rendering series that lets you display a large set of shapes with user defined centers and dimensions in the chart area. Several Shape Series used to build a house. This image demonstrates how to use the Shape Series to display bars with different sizes. 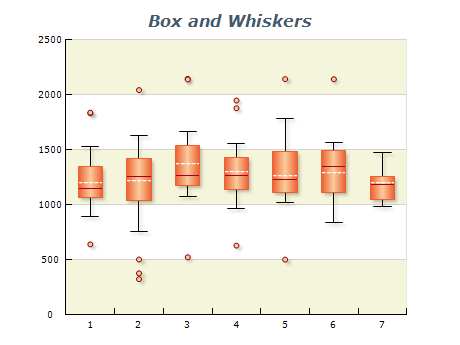 This image demonstrates how to use the Shape Series to display XYZ scatter bars. A versatile rendering series. The ultimate scatter plotter. Can display shapes with the following styles: Smooth edge, cut edge bar, pyramid, cylinder, ellipsoid, cone, inverted pyramid and inverted cone. The user controls the (X, Y, Z) position of the shape as well as its size along the X,Y and Z dimensions. Can also be used for complex composite object rendering. 2, 3, 4, 5 etc. 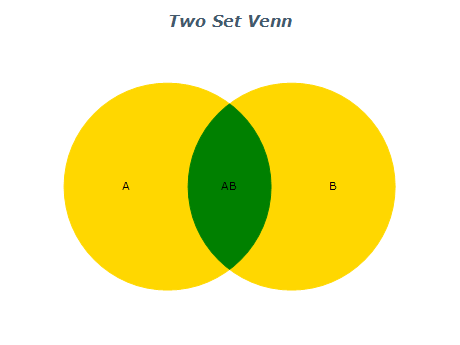 Venn set. An Error Chart can be used to indicate estimated error in a measurement. The error values are shown as "T" and upside-down "T" symbols above and below the primary value. The most common Error Chart displays errors only in Y values. 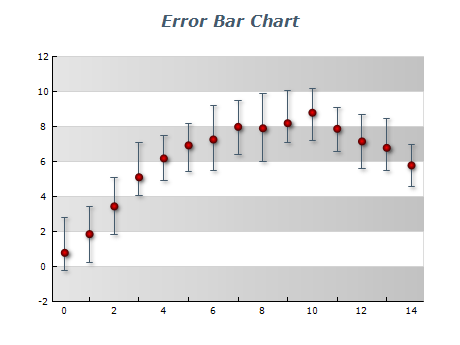 XY Error Charts can display errors both in X and Y values. XYZ Error Charts are available in 3D mode if you need to display errors for X, Y and Z values simultaneously. Funnel chart displays progressively decreasing values. It is usually used to represent sales process stages (from "the many" potential customers to "the few" who actually purchased), or any similar process of gradual elimination of parts of a multitude. A Funnel Chart with custom X sizes of the funnel data items. A 3D Funnel Chart with custom X sizes of the funnel data items. 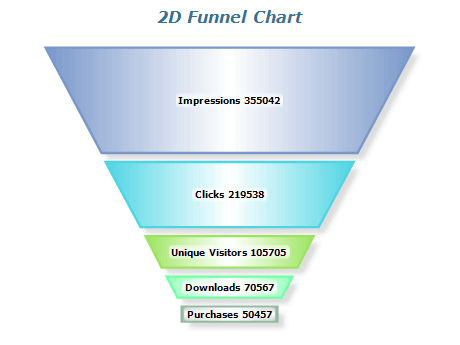 A 3D Funnel Chart with custom X sizes and no gaps between the funnel data items. Funnel charts are often used to represent stages in a sales process and show the amount of potential revenue for each stage. This type of chart can be useful also in identifying potential problem areas in an organization’s sales processes. A funnel chart is similar to a stacked percent bar chart. 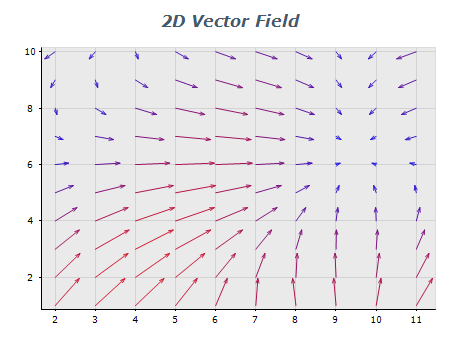 Vector charts display arrows in 2D or 3D space. A vector data item is defined by two points (begin - end) and is represented by a single arrow. An arrowhead is placed at the end point to indicate the vector direction. 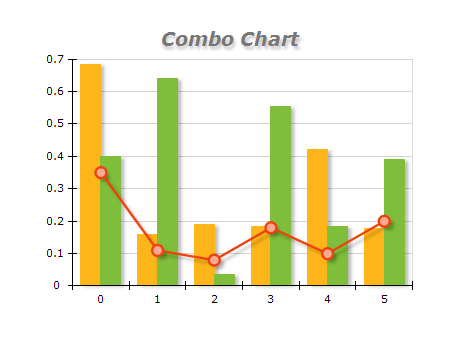 Combo Charts are used to combine certain series types within the same chart area. Series types are specified per values data groupings. There are many per series type options. 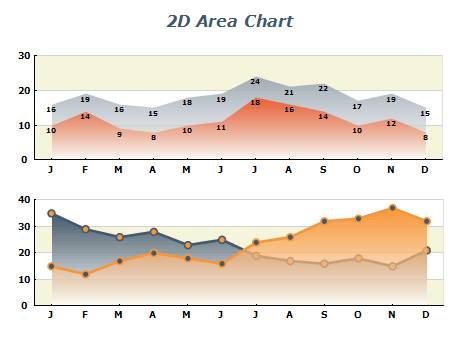 The Custom Series allows for painting of custom geometry within a 2D chart. It has the abilities of the chart’s custom painting feature and at the same time behaves like the other series, allowing you to specify its depth order and axis ranges. The image demonstrates one of the countless possible uses of the custom series. 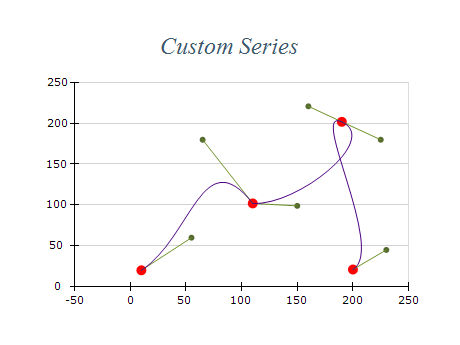 The Custom Series allows for painting of custom geometry within a 2D chart. 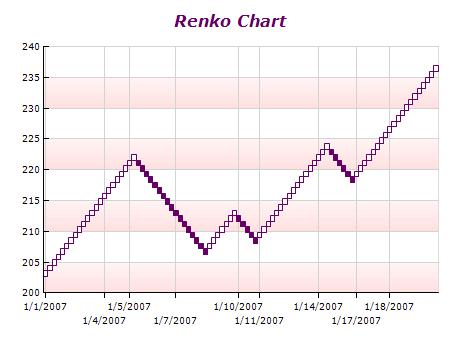 It has the abilities of the chart’s custom painting feature and at the same time behaves like the other series, allowing you to specify its depth order and axis ranges. Tree maps display hierarchical (tree-structured) data as a set of nested rectangles. Tree maps allow you to easily see patterns that would be difficult to spot in other ways, such as if a certain color is particularly relevant. A second advantage of tree maps is that, by construction, they make efficient use of space. As a result, they can legibly display thousands of items on the screen simultaneously. 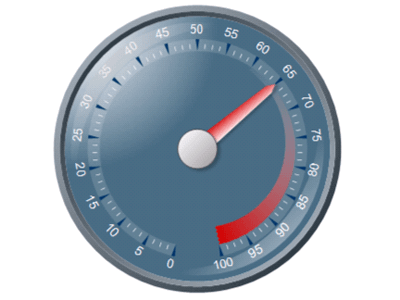 The Gauge offers a full range of advanced Gauge types, State Indicators and Numeric Displays that give applications a more meaningful way to display KPI's (key performance indicators), dashboards, and other critical data. Radial gauge panels allow displaying virtually any circular gauge. Gauge features include multiple indicators, multiple gauge axes, intelligent gauge scale decorations and many more. Linear gauge panels allow displaying virtually any linear gauge. Gauge features include multiple indicators, multiple gauge axes, intelligent gauge scale decorations and many more. 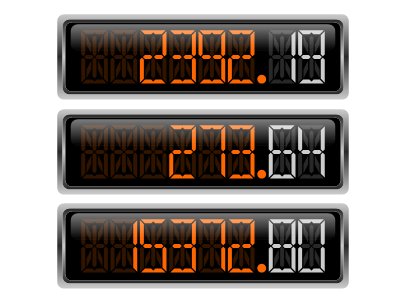 The Numeric Display Panel features various display styles, control over the decimal formatting, full control over the panel appearance and size and many others. 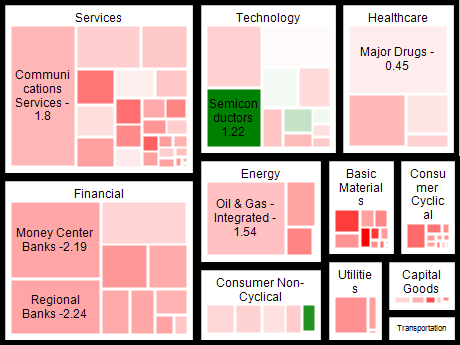 State indicators are used to represent a value as a visual state. For example the most common use for state indicators is found in car dashboards where usually a red led indicator is lit when the car will soon run out of fuel. Supports Primary and Secondary X and Y Axes. You can specify the X and Y axes on which each values data grouping (chart series) is scaled. Advanced settings allow you to make use of axis crossings, docking and percent positioning. In 3D charting, the axis model is extended with an additional depth (Z) axis. The Z axis allows data to be plotted along the depth of the chart. It automatically scales in Numeric or Categorical scale mode, allowing the creation of XYZ scatters and XZ-plane categorical plots. The special Radar and Polar axes are exposed for Radar and Polar charting types, providing advanced settings for complex requirements related to these charting types. 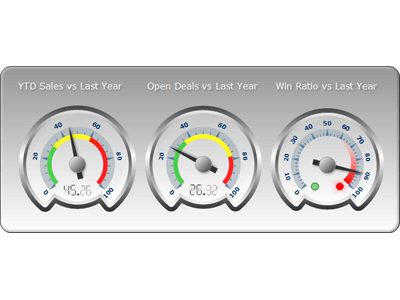 Number scale - allows you to display any data in numeric format (profit, sales, percentages etc.). 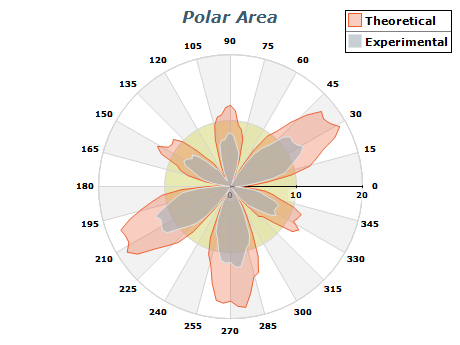 Angular scale - allows you to display angular data in degrees and grads (used in polar charts). DateTime scale - general date time scale suitable for the display of date time data. 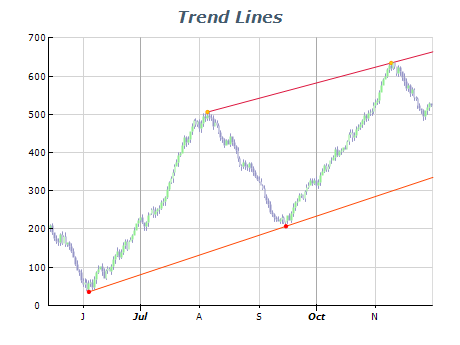 ValueTimeline scale - advanced date time scale most commonly used in financial charts. RangeTimeline scale - advanced date time scale most commonly used in financial and project management charts. Single row and grouped categorical labels. The axes of the component can be docked to the chart sides (or polar rim) or crossed at value with some other axis. In addition axes can share parts of the chart plot. Control over the title text, appearance, position and angle. Control over the begin / end ruler caps as well as option to highlight scale breaks on the ruler. Control over the range displayed by the axis. Ability to inflate that range in several modes. Control over the major and minor gridlines appearance. Control over the appearance and position of minor and major ticks. Ability to highlight repeating ranges of data on the chart walls, with controllable show / hide pattern. Ability to conditionally modify the appearance of axis decorations (tick, gridlines and labels) if they fall in a specified range. This feature allows you to highlight important ranges of data on the axis. Ability to show constant (reference) lines at specified value. In 3D mode you can also show planes crossing the plot at the specified value. 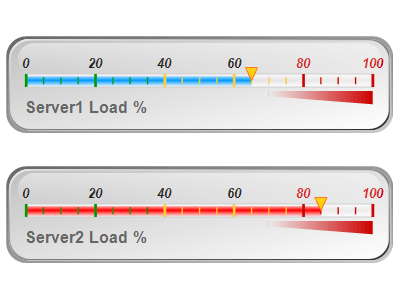 Axis Scale Breaks skip a range of values on the axis to increase the readability of the chart. Nevron Chart for Reporting Services provides support for manual and automatic scale breaks with full control over appearance and behavior. X and Y scale breaks can be crossed. Scale breaks are also displayed in 3D Mode. Ability to control how the axis must resolve label overlapping and layout options. Ability to control the label formatting on numeric scales - including many advanced options for currency, percentage, scientific and date time label formatting. 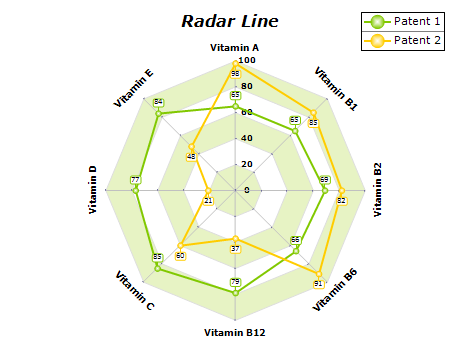 Data point labels of Cartesian, Polar and Radar charts can be automatically rearranged in order to avoid overlaps and ensure maximum visibility for the chart elements. Lots of predefined styles, positions and data layout strategies. Header and Footer. The component has extensive custom formula support with 50+ predefined functions including commonly used financial indicators like: Relative Strength Index, MACD, Bollinger Bands, Average True Range, Momentum, Stochastic Oscillator, Directional Movement System, Moving Averages, etc. State of art editors. Improved wizard. Creating a chart based on template and modifying its data and other settings takes not more than a few minutes. All design time editors are available at runtime including the Wizard. You can not only specify any filling you can specify in Excel but you can also visually create any custom gradient with the built-in advanced gradient editor. Static and dynamic axis positioning strategies and settings. Lots of predefined text layout schemes. 4 scaling modes - DateTime, Numeric, Logarithmic and Dimension scale. Paging with lots of customizations. Stripes, constant lines as planes or simple lines, custom axis labels, axis cursors, range selections. Advanced chart margins and fit strategy control. Making a chart type combination chart has never been easier and more flexible. Charts can be described on one or more legends. Legends can describe multiple charts. Fancy skin effects which add this such important final touch to your chart image. Ideal for company logos and trademarks - can be displayed on top or behind the chart image with user controlled transparency. Headers, footers as well as custom positioned labels. Trackball, zoom, offset, mouse cursor change, mouse tooltips and more. Extensive drill down support. Lots of events for both WinForms and WebForms. 360 degrees rotation, viewer rotation, orthogonal and perspective projections, offset, zoom as well as a lot of predefined projection schemes. Lots of predefined lighting schemes. Up to 9 light sources. Spot and Directional light. Support for docking, nesting and anchoring of panels. AutoSize and custom size, bounds mode and more makes the creation of complex, scaleable layouts easy and comprehensible. All styles and lengths are specified as a pair of value and measurement unit. More than 20 different measurement units (pixel, inch, millimeter, display etc.). Annotation support that also allows nesting of panels and anchoring panels to key elements of the chart like data points or legend data items. Arrow, Rectangular Callout, Rounded Rectangular callout, Cut edge rectangular callout and Oval callout. Master slave axes, master slave range selections and master slave cursors. Build on top of the Nevron Presentation Framework and Nevron DOM (Document Object Model) Framework. Custom binary and XML structured serialization. Nevron chart can export images with interactive features in SVG format. The chart editor supports direct update feature allowing you to instantly preview the changes in the chart DOM. The custom serialization capabilities of the control allow for version tolerant serialization of the control state in binary and XML form. Grid and Toolbar components for WinForms. The grid is data aware and supports true date time editing as well as fill effect, line style and cursor type editing. The most frequently used commands are exposed by the Toolbar, which also supports custom buttons and runtime visual configuration. This feature is very useful for real time applications because it frees your CPU from drawing the chart and transfers all the rendering to the CPU of the video board. Advanced built-in printing and print - preview support. 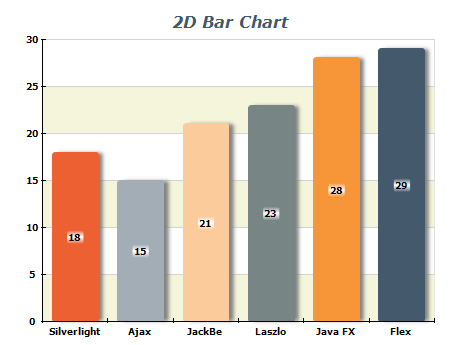 Nevron Chart for .NET supports ASP.NET 2.0 AJAX 1.0. Nevron web controls allow AJAX callback handling of the following mouse events: click, double click, move, down and up. The web controls can be forcibly refreshed at client-side. Auto-refresh feature is also available. The image maps generated by the component can display tooltips, redirect the client browser to a specified URL or change the mouse cursor. The component can preserve its state across roundtrips. With the help of this feature you can seamlessly integrate the image maps generated from the component with any type of client side VBScript or JScript. This is an indispensable feature when building scalable and secure server side applications. The component automatically detects when a temporary file is expired and deletes it from the server. You can also assign disk space usage quota for the directory holding the temporary files in order to ensure that you cannot exceed the space used by your web server application. By leveraging the power of the .NET regular expressions you can instruct the component to generate different responses depending on the browser accessing the page. Nevron has teamed up with CenterSpace to provide advanced .NET Numerics and Data Visualization solutions to our customers. The need for data analysis is almost always followed by the need of data visualization. That is why Nevron Software and CenterSpace Software have teamed up to bring a complete end-to-end solution from analysis to visualization. This partnership provides our customers with a clear pathway from raw numbers to industry leading applications. We have prepared an example project of Nevron Chart and NMath working together. To get started, review the Nevron Chart/NMath Examples! As part of our partnership we are offering a discounted bundle containing the Nevron Chart for .NET Enterprise Edition and CenterSpace NMath Suite. To purchase this package, please contact Nevron Sales and ask for our CenterSpace partnership discount.